Summary: Unless you’ve got a burning desire to see some old-timers trying to turn back the clocks and running around in a film they know in their heart-of-hearts is more at home on the small screen, wait for the DVD. 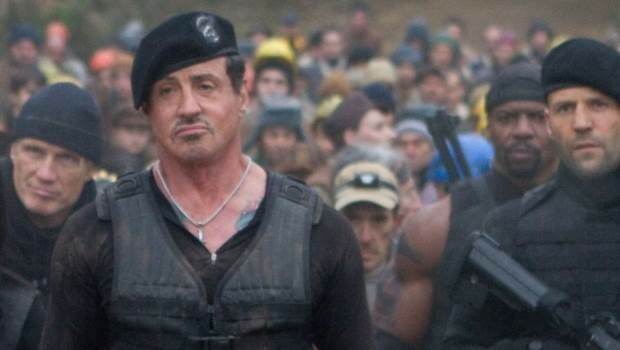 Sylvester Stallone sent fans of one-man-army movies into hysteria by signing up some of the biggest action stars for one explosive outing. Yet for all the hype surrounding The Expendables, it turns out the action film to top all action films we thought we were getting was just Stallone’s testosterone talking. What Sly has done is take a straight-to-DVD hokum and shoe-horned in the names to build the pre-release buzz to mask a laboured excuse for taking on an fortress full of foes with oversized guns. He’s got a formidable band of allies. Regular fixtures on the current Hollywood action scene, Jet Li and Jason Statham, are present in the main supporting roles to give Stallone the much needed above the title name support while Dolph Lundgren represents the old skool of Stallone’s era. Along with Ultimate Fighting Champion Randy Couture and former NFL player Terry Crews, they are The Expendables – a group of mercenaries for hire who enjoy hanging out with tattooist Tool – a pipe-smoking Rourke. It’s a strange choice for Rourke, belying his newfound credibility following his performance in The Wrestler, though none of the actors are pushing their careers forward by revisiting past glories. The sight of Bruce Willis and Arnold Schwarzenegger in the same scene as Stallone has a certain charm and a few sly one liners, though it’s all over so quickly and seems to have been shot in such a rush that it’s hardly a pivotal scene: it’s more of a footnote which nods to Stallone’s past action hero rivals. Once their gone, it’s up to Eric Roberts, so often the villain, with his goon, former wrestler “Stone Cold” Steve Austin, to provide the bad guys running rule over a foreign South American dictator and give The Expendables team an excuse to rescue a beautiful girl stuck in a bad place (Giselle Itie) while blowing up everything in sight. Generic? You bet. It’s hardly surprising Jean-Claude Van Damme and Steven Segal turned down the chance to appear in The Expendables – if they’d read the script they would have seen there was very little room for them to make any impact as Stallone hogs the limelight with his barely-intelligible mumblings or taking an excuse to flex his muscles. Schwarzenegger and Willis have seconds on screen with only Li and Statham having a chance to shine. Though Statham does a good job of scowling and budding up to Stallone, Li’s martial arts skills are wasted, his character a cultural stereotype and often looks embarrassed. The other “new” breed of action stars are just there to make up the numbers and make The Expendables appear more star-studded than it really is. Stallone’s managed to get a lot of people into cinemas already to see The Expendables by getting a load of beefcakes together, but unless you’ve got a burning desire to see some old-timers trying to turn back the clocks and running around in a film they know in their heart-of-hearts is more at home on the small screen, wait for the DVD.